Kinsta hosting is a premium managed WordPress hosting service that uses Google's cloud platform to host your sites. This means hosting your WordPress site at the speed of Google. Voted as the "most reliable hosting company" by CodeInWP, Kinsta hosting is trusted by the likes of AdEspresso, Intuit & SparkPost. Developer-friendly (comes with WP CLI, SSH access, ability to run different PHP versions, complex reverse proxy configurations to name a few. Beginner/business person friendly (You don't have to worry anything, the team manages everything from security, backups, to free repairs for hacked sites. It's a bit costly but takes every single headache about hosting, blog security etc from your head. I just got my hands on Kinsta and I'm loving it. The ambiance of the MyKinsta dashboard, the feeling of site security and omnipresent support staff (they're always there!) that you can trust your business on is something worth trying. Not to mention the speed that I thought was never possible. I've had my fair share of good and terrible hosts, but at this stage my business completely deserves Kinsta. Check below to see why you need them too. Choosing your website’s hosting is one of the most important decisions you’ll make. Hosting is your site’s engine – and you wouldn’t spend all your time and effort restoring a car just to put some tiny, low-power engine in it, would you? No – you want to pick a host that gives your awesome website the foundation that it deserves. If your site is starting to get some traction and you need stellar performance to keep things running smoothly, I think Kinsta might just be that host. 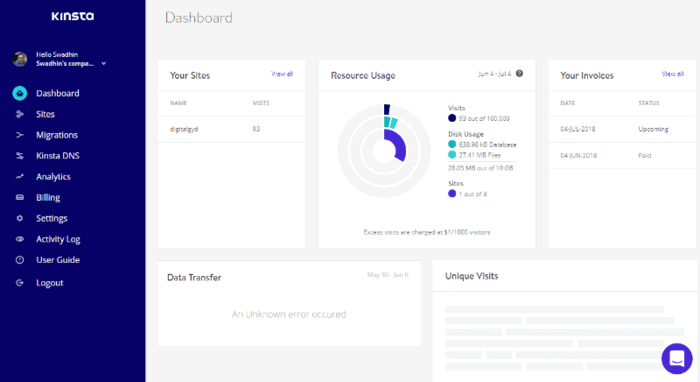 Beyond some of the best performance you’ll find in a managed WordPress host (like Flywheel), Kinsta also offers a great dashboard full of features to make managing your site easier. 9. Kinsta Security Review: How Secure Is Kinsta Hosting? Kinsta Plans and Pricing Review: Is Kinsta Worth the Money? 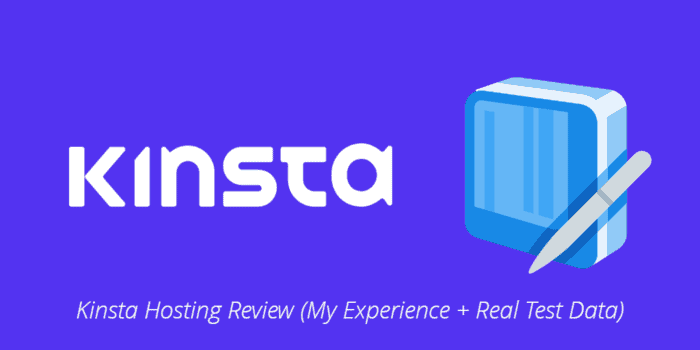 Kinsta Hosting Review 2019: Should You Use Kinsta Hosting? Makes your site load really fast (I’ll show you the data in a second). Gives you features to make it easier to manage your site, like a dashboard where you can create staging sites, set up redirects, and more. Helps you with basic maintenance, like updates and automatic daily backups. Beyond those core benefits, Kinsta is also powered by Google Cloud Infrastructure’s premium tier plan – yes, your site will run on the same technology that powers Google’s own websites. And you have tons of control over where your site’s main data center is located thanks to Kinsta’s 15+ available data centers. Another big advantage about hosting your site with Kinsta is, they use LXD containers feature (thanks to Google’s cloud platform) which means each site hosted with them will be isolated from every other site and will have its own resources like NGINX, MySQL, PHP etc. This makes your site much more speedier (since you don’t have to share resources with “n” number of sites and keeps it more secure (as infected sites can’t contaminate your LXD container). I don’t want to bore you by just repeating the features list that’s available on Kinsta’s homepage, so let’s jump into some real performance tests, and then I’ll single out some other things I think Kinsta does well. If you’re a developer, you’re probably nodding your head at that list. But if you’re a blogger, you probably don’t care about those fancy terms unless they actually translate into making your site faster. I set up a test site at Kinsta using an Astra theme starter site (a theme we recommend for bloggers). I did this to make sure it has all the features you find on a real site. Let’s try some other tools to see if Kinsta is consistent. Finally, I wanted to see if Kinsta could still deliver fast load times even when receiving traffic. That is – if your site receives thousands of visits every day, will Kinsta still be able to load quickly for every single visitor? This graph basically shows that as the number of active visitors increased (the blue line), my test site’s load times stayed flat between 50ms and 70ms (the green line). It means that your site will load just as quickly for the fiftieth visitor as it does for the first visitor. Yet another case study that shows why Kinsta is the second name of website speed is from SkyrocketWP. They came to Kinsta in search for speed and they were so impressed that they ended up migrating 100+ sites from WP Engine to Kinsta. 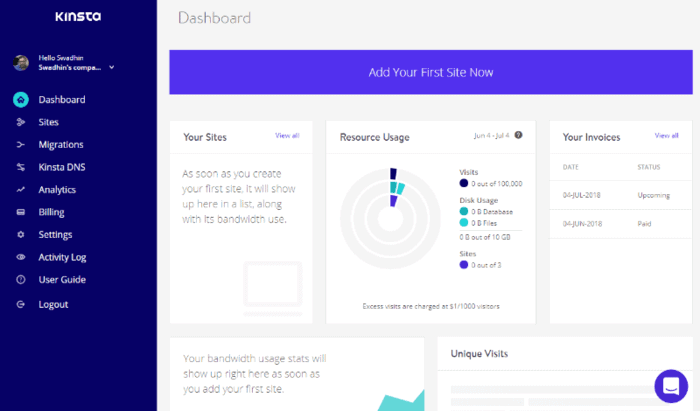 Beyond performance, Kinsta hosting has a lot of other features that make managing your site easier. If you’ve previously used a cheap shared host, you probably used cPanel to manage your website and server. cPanel is functional, but it’s not especially user friendly. 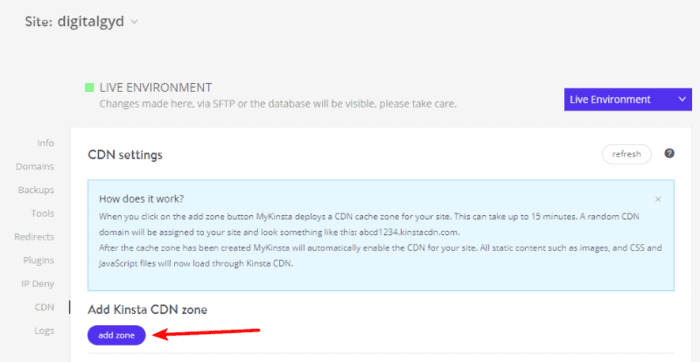 Kinsta does not use cPanel, instead opting for its own custom dashboard called MyKinsta that I can guarantee you’ll find much nicer to use. And in the following sections, you’ll see a bunch of examples how this custom dashboard can make it easier for you to manage your site. Apart from being a visually appealing, MyKinsta has a lot of other advantages you don’t get with hosts that use traditional cPanels or Plesk. 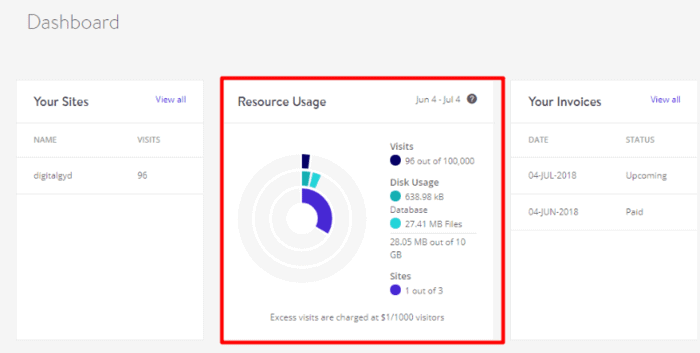 While MyKinsta offers all of what traditional cPanels come with, MyKinsta offers you direct access to site migration wizard, let’s you monitor site performance, helps you push staging sites to live and also comes with the search and replace tool, right from the dashboard. This in my opinion is quite handy and gives you full control over your site (if you want to manage at your end). 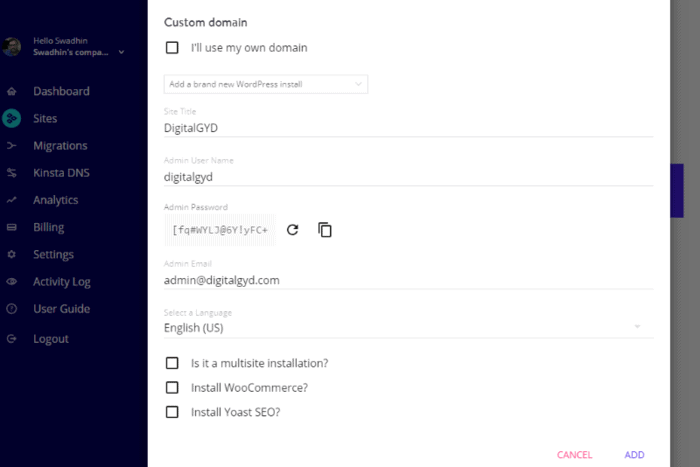 Plesk offers almost everything MyKinsta does, but MyKinsta outpowers Plesk by helping you activate SSL via a single click and comes with a search and replace tool that Plesk lacks. That’s why I love that Kinsta automatically backs up your site for you every day. 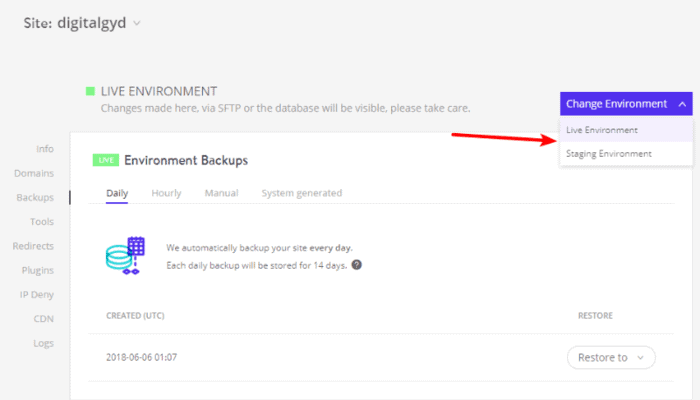 For each backup that Kinsta stores, you can use the Restore button to either restore the backup to your live site or staging site. Staging sites are a powerful feature that let you safely test changes to your site on a private (but identical) copy of your site before you push them live. For example, you could test a new plugin’s functionality … or a theme redesign … or a special feature on your website that you want to beta-test on your staging site before actually moving the plugin to your live site. It’s really handy…and Kinsta makes it super easy to create a staging site. If this is your first time, you can create a new staging environment. Once you’ve finished that, you’ll see a duplicate of all your dashboard options but for your staging environment. You can play around with your staging site just as you would a live site. 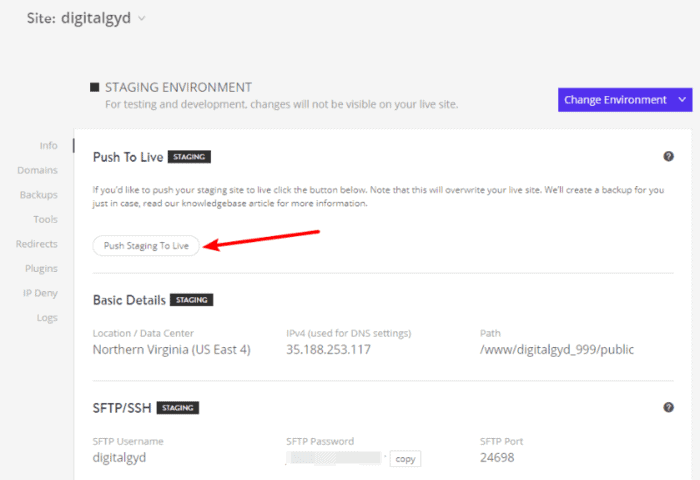 Like I mentioned – Kinsta will automatically back up your site whenever you move your staging site live. 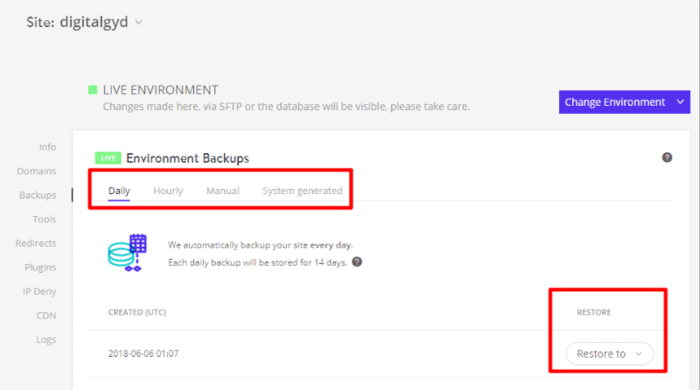 So if you want to revert your changes, you just need to restore the backup. Using HTTPS makes your site more secure for both you and your visitors. It’s also a positive ranking signal. And oh yeah, Google is about to start marking all non-HTTPS pages as Not Secure in July 2018. So you need to use HTTPS…but setting up the SSL certificate you need to use HTTPS can be confusing. A CDN helps you speed up your site’s page load times around the world. With pretty much every other host, you need to pay for a separate CDN service to use alongside your hosting. KeyCDN (the one Kinsta uses as it’s CDN service) has over 25 POPs which means your content will be cached and delivered from 25 locations around the globe. The exact amount of bandwidth that you get depends on your plan. 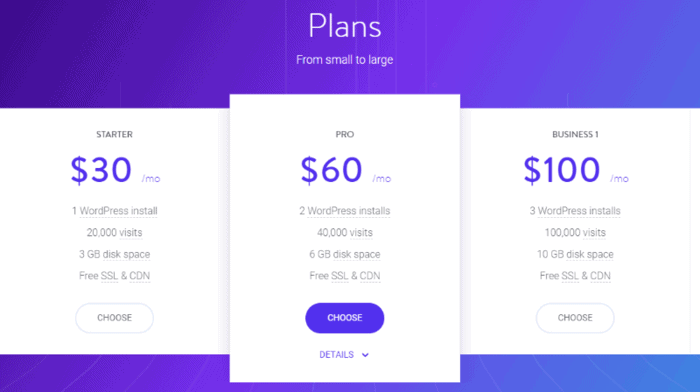 But even the cheapest Kinsta plan includes 50 GB of CDN bandwidth per month which is more than enough for most. If you’ve spent some time running a website, you’ve probably had to use 301 redirects to preserve your site’s SEO and make sure visitors get to the right place. 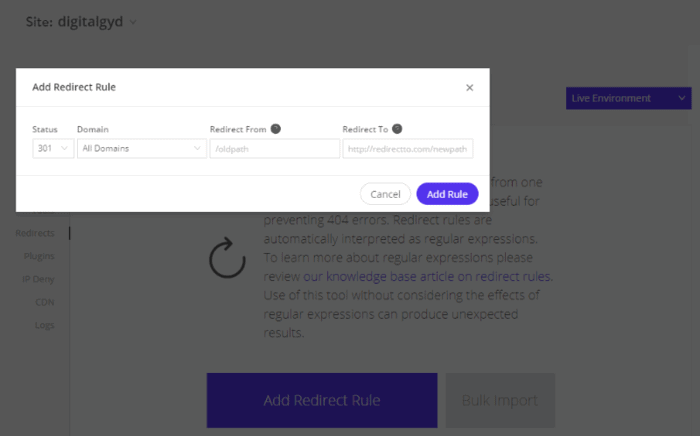 Kinsta eliminates the need for either method with its built-in redirect tool. If you like digging into data to optimize your site, you’re going to love Kinsta’s in-dashboard analytics. But if you’re a developer, you can use these stats to go a lot deeper. 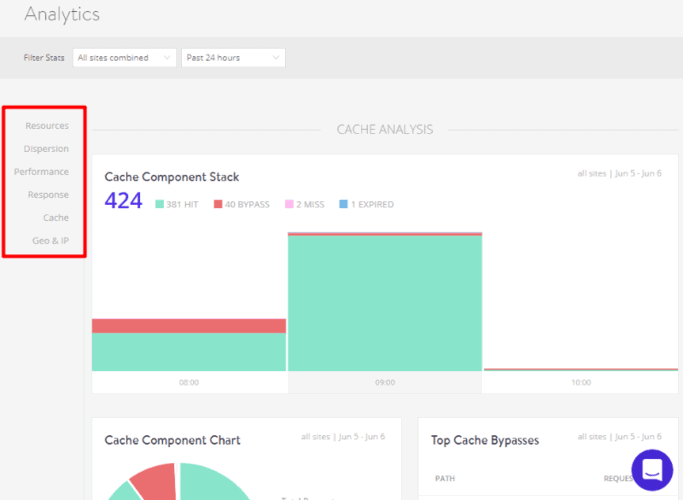 For example, you can see your cache stats, your PHP throughout, and lots more. If you’re a casual user, you don’t need to worry about anything I just said…but developers like this stuff! DNS is like the phone book of the Internet. It’s what connects your domain name to your web server. Every time someone visits your site, that person’s web browser has to query your DNS nameservers to actually get the IP address to your server. If you’re like most webmasters, you probably use your host’s DNS servers to point your domain name to your web server. That’s the easiest approach…but it’s also pretty slow. And using a different DNS provider can speed up your site. For example – look at the DNS Performance results. The fastest DNS provider is ~10ms – the slowest is ~128 ms (and your host is probably even slower!). That’s a big difference! 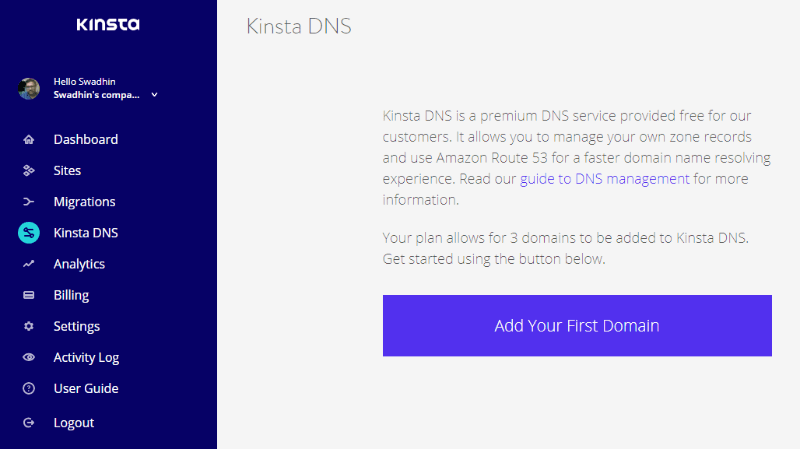 Kinsta helps your site load fast by giving you free premium DNS via Amazon Route 53. That’s something you’re not going to get at most hosts. 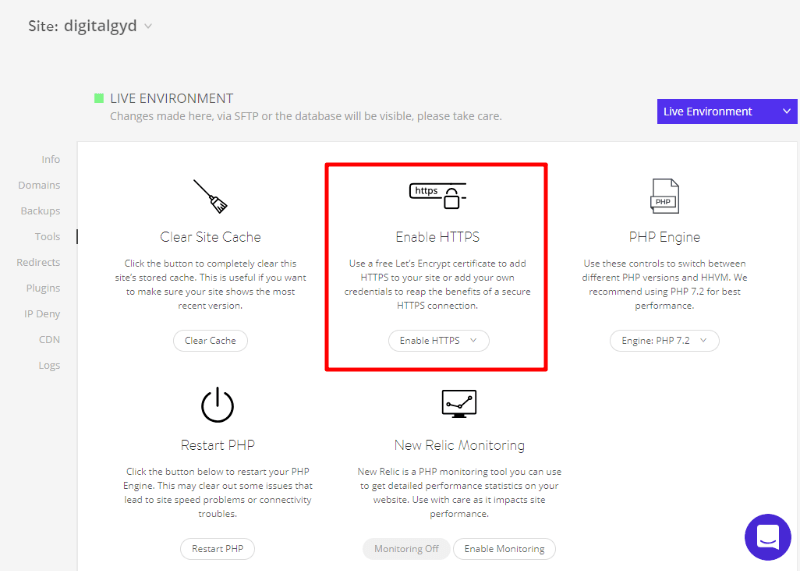 Kinsta hosting offers free SSL, free CDN that do somewhat protect you from security breaches. Apart from that, Kinsta team regularly monitors spikes, uptime, and security threats like DDoS attacks to keep your site protected. They can help you block specific IPs you want to block from accessing your site. But what happens if your site is compromised anyway? This is the max you can expect from your hosting provider. And for me, it’s like more than I can ask because of the terrible and horrible experience I had with Hostgator (they instead of helping me pushed a upsell to buy a third-party service that would cost me upwards of $500 to get my site cleaned). Furthermore, since each site hosted with Kinsta has it’s own container so even if you’ve 50 sites in your account, the rest 49 stay infection-free (Hostgator got 3 of my sites infected from one infected site). If you’re security-conscious, you’ll find Kinsta’s Activity Log feature really handy. This comes in especially handy if you’re giving other people access to your hosting account. It requires you to open a separate window. And if you accidentally close that window, you lose your chat. There’s no easy way to access past transcripts. Kinsta avoids those problems by using Intercom for live support. If you’re not familiar with Intercom, it’s that little floating icon in the bottom-right of all the screenshots I’ve taken. You can navigate to other areas in your dashboard without losing the live chat window. All your conversations are saved so that you can easily continue or access them at a later date. Apart from that, Kinsta’s support team and customer service has been unique and responsive. They go out of their way to help you with everything you need and don’t require you to instruct them steps, just tell what you want and they do it. 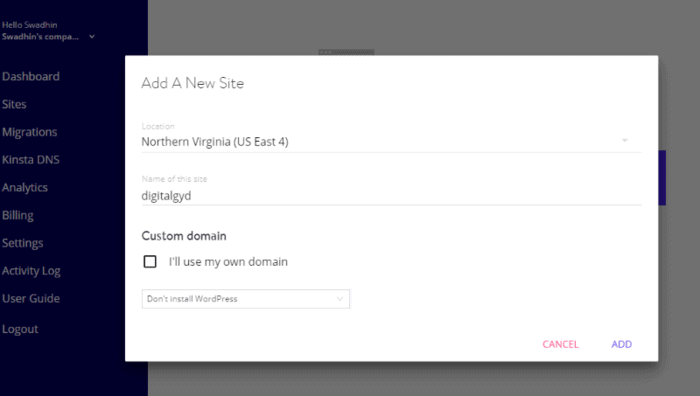 … Let’s see how you can create a site with Kinsta easily! When you click it, you can choose which data center you want to host it at from a lengthy list. I love Kinsta’s pricing plans. They have a clear pricing plan where you’re billed with a rounded off pricing (like $30, $50 and not $29.99 or $49.99). When bought annually you get 2 months free off any plan you choose. 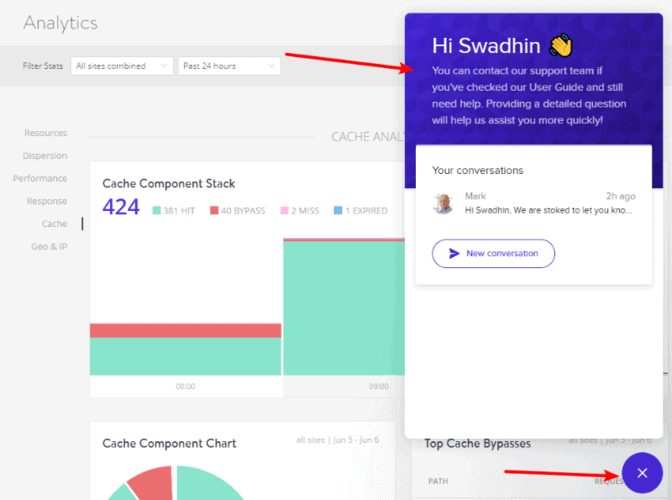 You can scale up or down or switch Kinsta plans hassle-free. As you can probably tell from the list above, I think Kinsta is great WordPress hosting. But I still don’t think it’s for everyone. No – I don’t think Kinsta is overpriced. If you compare it to other managed WordPress hosts, it’s more than competitive. I just don’t think every single webmaster needs something as powerful as Kinsta. If you’re just getting started, or if your site isn’t receiving much traffic, Kinsta might be overkill for your needs. To go back to the car metaphor from the intro, it would be like buying a Bugatti Veyron just to drive around the neighborhood at 25 km/h! So – if you have a growing site that requires speedy performance, absolutely go with Kinsta. But if you’re just starting your blog and aren’t receiving much traffic, stick with something more affordable like SiteGround until your site starts getting popular. Then, you can move it over to Kinsta using Kinsta’s free site migrations! From a performance and functionality standpoint, Kinsta is the best WordPress host that I’ve used. So looking at it just from that perspective, I have no hesitation recommending Kinsta as one of the best WordPress hosts. The only thing is the price. Like I mentioned above, Kinsta’s price is 100% fair and competitive. It’s just overkill for your needs if you’re just getting started with your website and aren’t receiving much traffic. But if you already have some traffic and need a high-performing host that makes managing your website easy? Yeah – Kinsta is a great option. If you want to focus on a business where your website doesn't need your attention, all messes get solved by the hosting team and is blazing fast (a ranking factor), then Kinsta is your thing. Here's my verdict on Kinsta review: If you want to focus on a business where your website doesn't need your attention, all messes get solved by the hosting team and is blazing fast (a ranking factor), then Kinsta is your thing. I am at present confused between WPengine and Kinsta. Do you have any experience of WPengine? How much difference does it make if your data centre is near to your majority audience? I think that makes a significant difference since a closer data center will make sure the site loads easily and faster (unlike traditional ones where it loads good around New York because their data center is located there and in Japan it will be around 7 minutes to load).